Groundhog day just passed us by. You know what that means, don't you? Groundhog Day is the mid point between the Dec 21 winter solstice (i.e. the shortest day , the "heart of winter") and the Mar 21 spring equinox. In other words..
...Spring is just around the corner! If your wedding date is this spring, you're probably busy arranging for all the final touches. 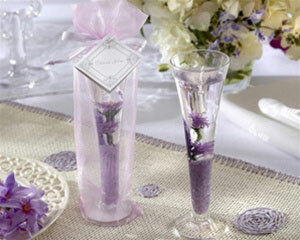 The guest favours, the small accents in the ceremony and the reception, cards, centrepieces etc. Here are some ideas to get you in the mood. We 're lazy, so we found one place that carries everything, The Wedding Shoppe online store. They have a great selection and they ship everywhere. But we 'll keep going and find more ideas for you this week and next - and we 're listing some more sources for you at the end of this article. Nothing says "spring" like a fresh bouquet of flowers. Which makes your choice of centrepieces quite easy.. all you have to decide is what type of vase and what type of flowers. The flowers are also easy - match them to your decor (and your budget!). 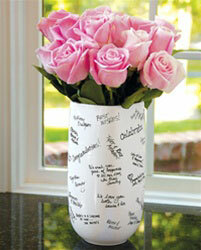 For the vase, this is a neat idea: leave a sharpie on the table, so that your guests can sign the centrepiece and leave their wellwishes. After the wedding, collect them and take them home as keepsakes or even let the guests take them home with them as mementos and extra favours..
Sticking with the flower theme, this is another great "combination idea". 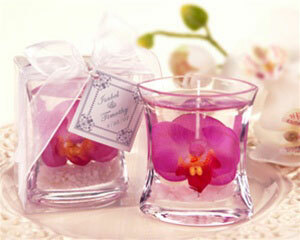 This scented candle containes a gorgeous orchid, suspended in gel. Appropriate both as a beautiful seasonal guest favour as well as as an elegant table decor item. I wonder if you can order them with an orchid in the color of your choice..
.. or try a variation of the above, the lavender gel candle. The colour is obviously different, as well as the shape.. totally up to you of course. I can't help but think how amazing a whole group of those would look, lit on each table at the wedding reception..
Having a spring and "green" wedding? This personalized little flower pot is perfect. It will match with your plantable seed invitations too! The picture show a cactus, which is easy, you can't kill a cactus no matter how brown your thumbs are :-) But you can plant whatever you wish. Actually, a good idea would be to buy these a couple of months in advance and plant them with the flowers of your choice. Perfect green favour and a great keepsake. Not enough, Show me more! OK, but you have to wait for the next article! Party Favour Central - search for "spring" on their search box. In Casa Gifts - same thing: search for "spring" on their search box. 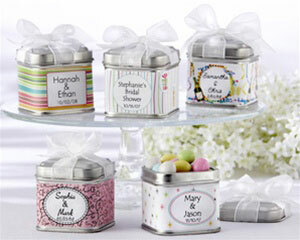 or simply scroll through our full list of canadian wedding favours & supplies companies. A great number of them are custom designers who can create exactly what you have in mind..